A luscious, lavish and romantic revival of SHE LOVES ME has recently set hearts atwitter at STUDIO 54 where Scott Ellis’ production is running through July 10th. The Roundabout Theatre Company has done a more than admiral job in remounting this best of all possible musicals first seen at the smaller Eugene O’Neill Theatre in 1963 – starring Barbara Cook, Barbara Baxley, Daniel Massey, Jack Cassidy and Ludwig Donath under the direction of Harold Prince with sets designed by William and Jean Eckart. Therein lies the rub. It’s not my fault that I saw the original. Loved the original. Have had it ingrained in my psyche ever since. It was perfection. However this revival has done its best to live up to my very high expectations bringing a new and younger audience to appreciate all its loveliness. Based on the 1937 play “Parfumerie” by Miklos Laszlo the score by Jerry Bock and Sheldon Harnick is tuneful, intelligent, funny, character driven and romantic. It can’t be beat. The concise book by Joe Masteroff doesn’t have an extraneous word. All the characters are well defined and have their individual songs in the spotlight. It is a delight to look at. With applause invoking swirling sets by David Rockwell and period costumes by Jeff Mahshie. 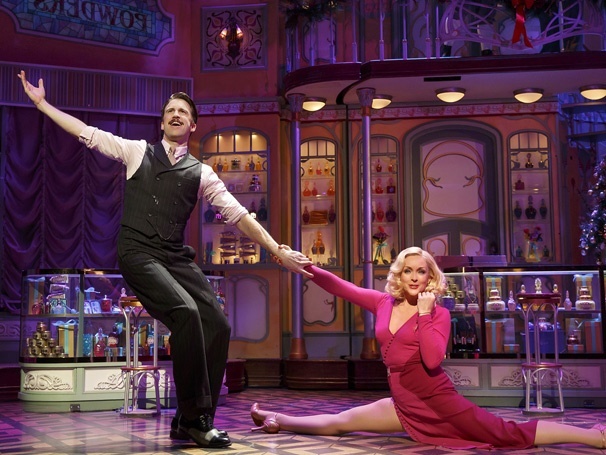 Scott Ellis has made SHE LOVES ME a bit brassier, a bit bigger adding some additional choreography by Warren Carlyle in a musical that doesn’t call for much dancing at all. There is also the over use of props during some numbers that distract from the words. The beautiful lyrics of Sheldon Harnick should stand alone. Trust the work. Gimmicks are uncalled for. Luckily the sound design by Jon Weston allows every wondrous word to be heard in this tale of romantic love. 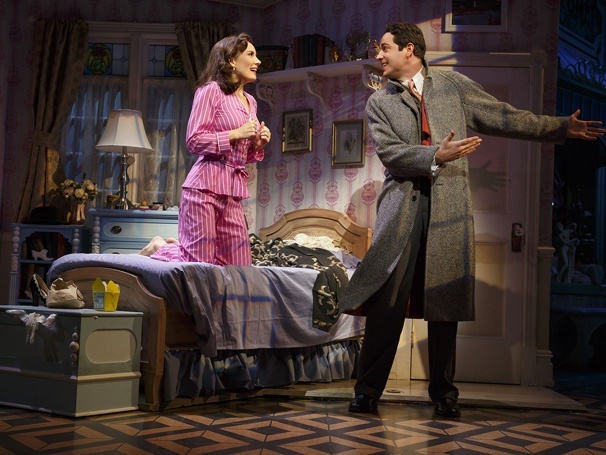 Amalia Balash (a lovely Laura Benanti) has been writing lonely heart letters to “Dear Friend” and is smitten. Georg Nowack (a terrific Zachary Levi in Jimmy Stewart mode) – Assistant Manager of Maraczek’s Parfumerie in Budapest 1934 has been busy writing back. Despite never meeting they seem to be made for each other until she comes a calling for a job and they instantly are at odds with one another. After seeing Barbara Cook in the original it’s hard to erase that perfect memory. Miss Benanti’s voice is different of course and she does a fine job even though she might have been having some problems with a noticeable glass of water nearby. She is a bit too headstrong and could be a bit more vulnerable but I will give her the benefit of my doubts. She and Mr. Levi work well together. The excellent Byron Jennings is an elegant Mr. Maraczek. His employee – cad and womanizer – Steven Kodaly (Gavin Creel in John Barrymore mode) has been having an affair with the flirtatious Ilona Ritter (a fabulous Jane Krakowki) and someone else as a side dish. Michael McGrath (Ladislav Sipos) a fellow worker is very amusing as usual but hardly Hungarian. Peter Bartlett who only has to appear on stage to evoke laughter is the Headwaiter of Café Imperiale where Amalia is set to have a rendezvous with her “Dear Friend.” And then there is Arpad. Arpad Laszlo (Nicholas Barasch) the ultra-charming, hard-working and ambitious delivery boy just about steals the show with his plea for a job as a clerk “Try Me” in Act II. The still in high school Mr. Barasch is destined for a wonderful career. He matches his professionalism with these already established stars and then some. Red hair. Attractive and super talented. When did I fall in love? Truly? In 1963. 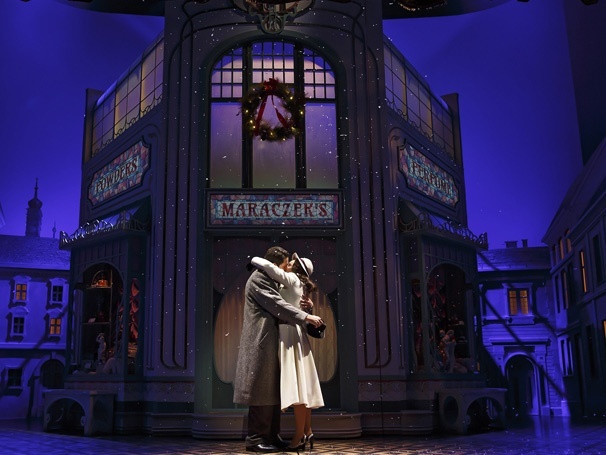 But this satisfying and entertaining production has rekindled my infatuation with SHE LOVES ME. Recommended for all lonely hearts.